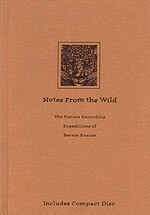 CD review: "Notes From the Wild: The Nature Recording Expeditions of Bernie Krause"
This review first appeared in the December 6, 1996 issue of the North County Times. Bernie Krause records nature. Real nature, not those "ambient" or "relaxation" recordings for yuppies  sappy albums of crackling fires or waves at the beach. How many people will find the low, throaty growl of a jaguar relaxing? Krause hauls his portable tape deck out into what few remaining wildlands the are, sets up camp, and records nature as it happens. The results are unique; Krause has spent the past three decades studying his craft and learning how to set up his microphones and volume controls to capture nature exactly as it sounds in the wild. For this compilation, he has included samples from a South American jungle (with that jaguar nearby); the New Mexican desert (coyotes howling); Glacier Bay, Alaska; and the Rwandan jungle (gorillas growling). The accompanying book (or maybe the CD accompanies the book; it's hard to tell) includes entries from Krause's field diary during the trips to make these recordings. He also shares some autobiographical information, his philosophy of man's relationship to nature, and technical notes to give the listener background to these recordings.